Locusts, grasshoppers (mostly Acrididae and Pyrgomorphidae), crickets (Gryllidae) and katydids (Tettigoniidae) are insects of the order Orthoptera. Many are edible and more than 80 species of locusts, grasshoppers and crickets are consumed worldwide for human food in Africa, South America and Asia. They may be part of the normal diet, or delicacies sold by street vendors. They are eaten at home or in restaurants, both in rural and urban areas (DeFoliart, 1989; Ramos-Elorduy, 1997; van Huis et al., 2013). Locusts are a group of grasshopper species that become gregarious and migratory when their populations are sufficiently dense. 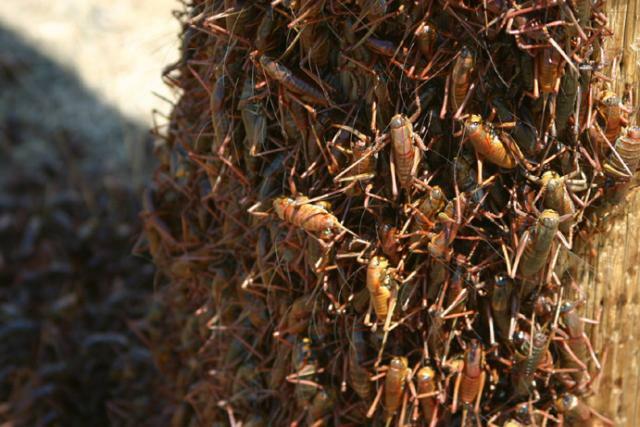 During the swarming phase, locusts destroy or severely damage crops. They are a major pest of historical importance, notably in Africa (North, West, Sahelian, Madagascar), Australia and the Middle-East. A locust swarm can represent a considerable amount of biomass, containing up to 10 billion insects and weighing approximately 30,000 t (DeFoliart, 1989; Ramos-Elorduy, 1997; van Huis et al., 2013). The swarming behaviour makes locusts relatively easy to harvest for food. 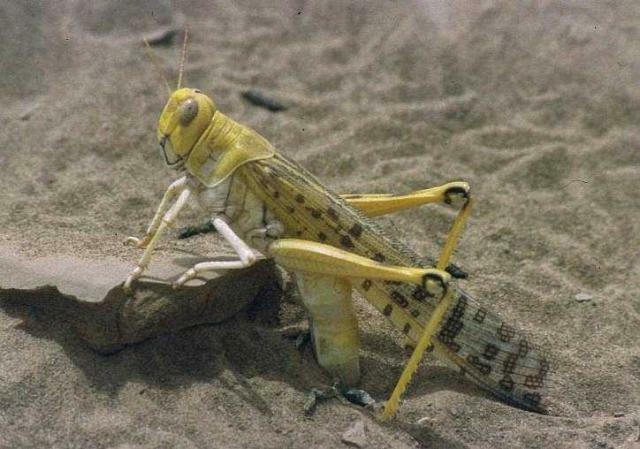 In Africa, the desert locust (Schistocerca gregaria), the migratory locust (Locusta migratoria), the red locust (Nomadacris septemfasciata) and the brown locust (Locustana pardalina) are commonly eaten. In Japan, China and Korea, rice field grasshoppers (including Oxya yezoensis, Oxya velox, Oxya sinuosa, and Acrida lata) are harvested for food (van Huis et al., 2013). In Mexico, chapulines, which are grasshoppers of the Sphenarium genus, and notably Sphenarium purpurascens, a pest of alfalfa, are popular edible insects (Cohen et al., 2009). The grasshopper Ruspolia differens, which is actually a katydid, is a common food source in many parts of eastern and southern Africa. Crickets are a common food in South East Asia, particularly in Thailand: the house cricket Acheta domestica, Gryllus bimaculatus, Teleogryllus occipitalis, Teleogryllus mitratus, the short-tail cricket Brachytrupes portentosus and Tarbinskiellus portentosus are edible cricket species (van Huis et al., 2013). Grasshoppers, locusts and crickets are usually collected in the wild, preferably at night (using artificial light) or in the morning when the temperature is cooler and the insects are less active and easier to catch. Due to the demand, commercial farming of locusts, grasshopper and crickets for the food and feed market is developing in South East Asia. As of 2012, there were about 20,000 cricket farmers in Thailand, raising the species Acheta domestica and Gryllus bimaculatus. Orthoptera, and particularly locusts, are commonly raised to feed pets and zoo animals (van Huis et al., 2013). In India, the mass-rearing of grasshopper species Oxya fuscovittata, Oxya hyla and Spathosternum prasiniferum has been studied experimentally. The use of jars with a volume of 2500 cm3 was sufficient to give a density of 10,000 insects per m3 for Oxya fuscovittata, and 7100 insects per m3 for Spathosternum prasiniferum, and resulted in mortality rates of 12 and 15% respectively. The smaller size of Spathosternum prasiniferum meant that more could be kept per unit area compared with Oxya fuscovittata (Das et al., 2009). When comparing Oxya hyla and Spathosternum prasiniferum, Oxya hyla showed higher values for fecundity, fertility and body weight and lower values for nymphal mortality. Brachiaria mutica was found more suitable than Dactyloctenium aegyptium and Cynodon dactylon for annual biomass production of both acridids (Das et al., 2012a; Das et al., 2012b). Sorghum halepense has also been proposed as a potential forage plant for Oxya fuscovittata (Ganguly et al., 2010). The house cricket, Acheta domestica, is easy to farm and can produce from 6 to 7 generations per year. It is omnivorous and can eat a large range of organic materials. Production is feasible at temperatures higher than 20°C, the ideal temperature being 28-30°C. 2000 insects can be bred on 1 m². The cricket population self-regulates by cannibalism (Hardouin et al., 2003). 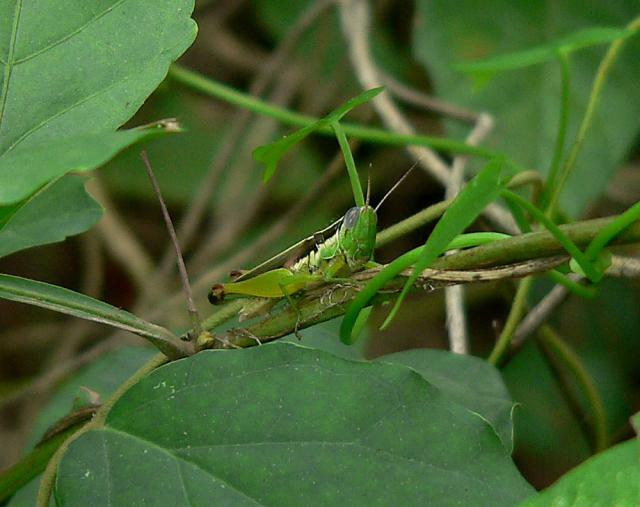 Orthoptera, like other insects, are highly nutritious and contain large amounts of protein. Various grasshopper, katydid and cricket species are already used for pets and zoo animals and have been investigated for livestock feeding. Because of the availability of large quantities of dead locusts, resulting from locust outbreaks, they are a good potential feed for livestock, especially poultry, and locust meal has been proposed as a poultry feed since the 1930s. Poultry are also a means to control locust and grasshopper populations. Since the 2000s, the development of aquaculture in Africa and Asia and the search of alternative sources of protein have led to trials on the feeding value of locusts and grasshoppers for catfish and tilapia. 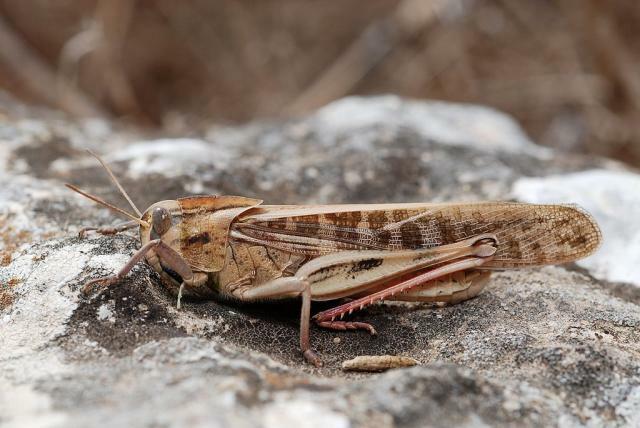 Locusts and other Orthoptera used for livestock feeding are fed live to free-range chickens, pets and zoo animals, but dried and ground for broilers and fish. Sometimes they are boiled before drying. The harvesting of locusts and other pest grasshoppers for food and feed is a means for their biological control and may help to reduce the application of chemical pesticides and, thereby, environmental pollution (Khusro et al., 2012). 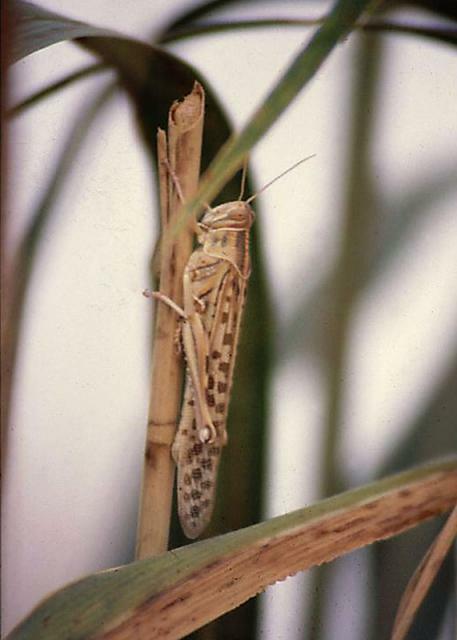 In Thailand, the outbreak of patanga locust (Patanga succincta) in maize in the late 1970s led to a campaign to promote the eating of this locust, which is now farmed for food purposes (van Huis et al., 2013). 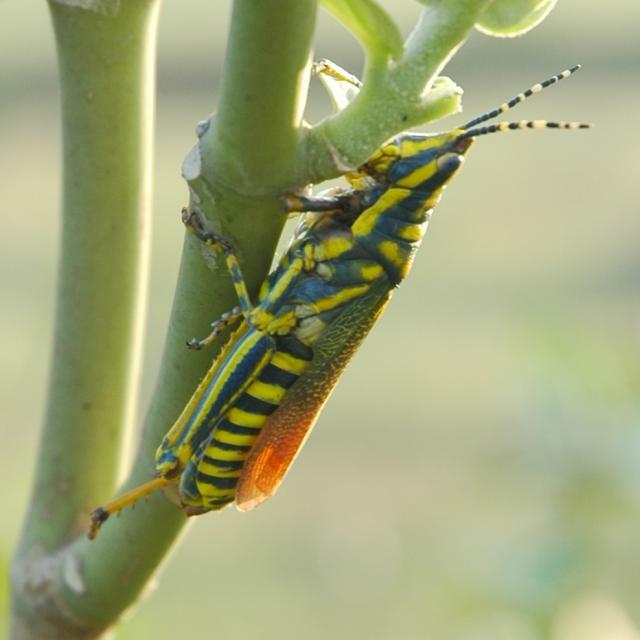 In Mexico, hand-picking of chapulines grasshoppers infesting alfalfa fields decreased environmental damage, while generating an extra source of nutrition and income from the consumption and sale of grasshoppers (Cerritos et al., 2008). The presence of livestock can also help to control locust populations. In China, free range chickens at a stocking rate of 3.3 head/ha could control the infestation of pastures by locust species Oedaleus infernalis, Oedaleus asiaticus, Haplotropis brunneriana, Bryodema tuberculata and Locusta migratoria (Li LianShu et al., 2005). In Australia, chickens have been reported to control populations of wingless grasshopper (Phaulacridium vittatum), a pest to viticulture, agricultural crops, pastures and trees (Khusro et al., 2012). In the USA, several studies have shown that some cattle grazing systems, especially rotational grazing, could reduce outbreaks of pest grasshoppers such as Ageneotettix deorum, Aulocara elliotti, Melanoplus sanguinipes, Melanoplus packardii and Camnula pellucida, by reducing food availability and by altering the microclimate and potential oviposition sites (O'Neill et al., 2003; Onsager, 2000). Locusts and other Orthoptera species are generally rich in protein, in the 50-65% DM range, though some lower values (less than 30%) have been reported. The dry matter content is 23-35%. The fat content is variable and ranges from relatively low values (less than 5%) to over 20%. The calcium content is low, as in other insect species. The fibre content may be significant and increases with age: adult crickets contain up to 22% DM of NDF vs. 12% for the nymphs (Finke, 2002). Due to their status as agricultural pests, locusts and grasshoppers may be sprayed with insecticides in governmental control programmes or by farmers, resulting in significant amounts of residues in consumed insects. These risks are of major concern in the traditional practices of harvesting and consuming insects in the wild, where the control of chemical applications is difficult (van Huis et al., 2013). For example, in Kuwait after the outbreak of 1988/89, high concentrations of residues of organophosphorus pesticides were detected in locusts collected for food (Saeed et al., 1993). In Korea, the mandatory use of pesticides in rice fields led to a decline in traditional grasshopper consumption in the 1970s, which resumed in the 1990s with the increase of organic rice farming. In Mali, the increasing use of pesticides in cotton farming has led to a decline in grasshopper consumption by children in rural areas, with negative consequences on the protein intake of these children (van Huis et al., 2013). One study showed that broiler chicks fed locusts that had been sprayed with an insecticide had a lower intake than chicks fed untreated locusts (Gibril, 1997). In California, an outbreak of lead poisoning in 2000 in the Mexican community was traced back to the consumption of chapulines grasshoppers (Sphenarium) imported from Mexico to the United States. It is suspected that lead, up to 2500 ppm in the insects, had bioaccumulated in the insects from the tailings of silver mines in Oaxaca (Handley et al., 2007). The presence of large spines on the tibia of grasshoppers and locusts may cause intestinal constipation, which has been shown to be fatal in monkeys, in the wild, and has occasionally required surgery in humans. Grinding or removing the legs and wings is, therefore, recommended prior to consumption (van Huis et al., 2013). Information about feeding Orthoptera to pigs is limited and ancient. In Eastern Africa, dried red locusts (Nomadacris septemfasciata) fed to pigs in a mixed diet (20% protein) resulted in a satisfactory growth rate, but the fresh meat and bacon had a definite fishy taint. Removal of the locust meal from the diet three weeks prior to slaughter reduced the taint but did not completely eliminate it (Hemsted, 1947). Free-range chickens have been proposed as a means to control grasshopper populations (see Environmental impact on the "Description" tab). Furthermore, chasing a food source increases poultry movement and exercise, enabling them to forage further and exhibit a wider range of natural behaviour. In the Philippines, It has been reported that free-range chickens fed on grasshoppers have a preferred taste and have a higher market price than those fed on conventional commercial feed (Khusro et al., 2012). In the Tibetan Plateau, free-range chickens reared on grassland containing a large population of grasshoppers had lower live weights, breast, wing, thigh and drum weights, and higher dressing percentage and breast percentage, compared with chickens fed a soybean meal-maize diet. Breast meat had a higher redness value, shear force and protein content, and lower pH, cooking loss, moisture and fat content. Sensory panel results for breast and thigh meats showed no specific colour and juiciness, but higher scores for chewiness, flavour, aroma and overall appreciation, and lower scores for tenderness (Sun Tao et al., 2013). The meat from free-range grasshopper-fed broilers had less cholesterol and higher concentrations of total lipid and phospholipids (Sun Tao et al., 2012a) as well as more antioxidative potential and a longer shelf life (Sun Tao et al., 2012b). In the Philippines, an early study reported that locust meal was not as efficient, but was as palatable, as fish meal (Fronda, 1935). More recent studies have tried to replace part of fish meal with locust and grasshopper meal and found that such partial substitution is generally suitable. In Nigeria, broilers (1-28 days old) given desert locust meal (Schistocerca gregaria) to replace 50% of the protein from fishmeal (1.7% of the total diet) gave better body weight gain, feed intake and feed conversion ratio (Adeyemo et al., 2008). In China, meal from the grasshopper Acrida cinerea replaced 20% and 40% fish meal in broiler diets with similar growth rates and feed consumption as the control diet (Liu ChanMin et al., 2003). In Nigeria, grasshopper meal (unspecified species) included at 2.5 to 7.5% in broiler (1-49 days old) diets depressed weight gain and feed efficiency, though it increased the protein content of the carcass (Ojewola et al., 2003). In a later study, grasshopper meal included at 2.5% of the diet was found to be a suitable and cheap substitute for imported fish meal (Ojewola et al., 2005b). Several experiments have studied the value for broilers of Mormon cricket (Anabrus simplex), a swarming American katydid. Broilers (1-21 days old) fed a diet of 62% maize grain and 30% cricket meal had better growth rates than broilers fed a control diet based on maize, fish meal and meat and bone meal. Amino acid supplementation did not improve performance. No palatability issues were observed (DeFoliart et al., 1982). In a later experiment, maize-cricket diets containing crickets at 28% (1-3 weeks), 22% (4-6 weeks) and 18% (7-8 weeks) were compared to maize-sobyean meal diets in broilers up to 8 weeks: there were no significant differences in weight gain and the feed:gain ratio, and no adverse effect on the taste of the meat from birds fed the maize-cricket diet (Finke et al., 1985). 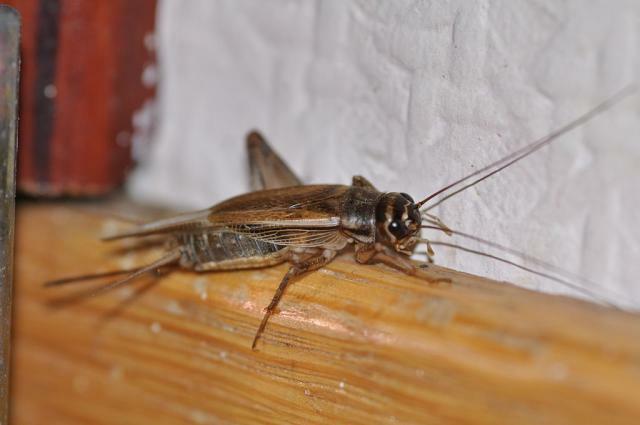 A similar experiment with a diet based on maize and 25% house crickets (Acheta domestica) fed to broilers for 2 weeks showed that cricket-based diets led to better feed:gain ratios than the control diets (Nakagaki et al., 1987). Methionine and arginine were limiting factors in diets based on Mormon crickets and house crickets (Finke et al., 1985; Nakagaki et al., 1987). In China, field crickets (Teleogryllus mitratus) could be included up to 15% in the diets of 8-20 day broilers without any adverse affects on weight gain, feed intake or feed:gain ratio (Wang Dun et al., 2005). In India, Japanese quail (Coturnix japonica japonica) were fed with various diets in which grasshopper meal (Oxya hyla) gradually replaced fish meal. For a range of growth parameters, the best results were obtained with the diet in which 50% of the fish meal was replaced with Oxya meal. Fecundity (i.e. the number of eggs laid per female) was significantly higher, compared with the control treatment (Haldar, 2012 cited by van Huis et al., 2013). Desert locust meal (Schistocerca gregaria) was used to substitute up to 25% of the dietary protein in Clarias gariepinus juveniles without a significant reduction in growth. Excess chitin may have contributed to reducing performance and feed efficiency when higher substitution rates were used (Balogun, 2011). Meal of the adult variegated grasshopper (Zonocerus variegatus) replaced up to 25% fish meal in the diets of Clarias gariepinus fingerlings without any adverse effect on growth and nutrient utilization. Higher inclusion rates decreased digestibility and performance (Alegbeleye et al., 2012). Several studies have investigated the effects of feeding dried Indian grasshoppers (Poekilocerus pictus) on the histological and physiological parameters of walking catfish (Clarias batrachus). A 91-day exposure to dried grasshopper feed had no effect on hematological parameters but resulted in a little shrinkage in the gills as well as in a reduction in ovarian steroidogenesis, which may reduce fertility (Johri et al., 2010; Johri et al., 2011a; Johri et al., 2011b). Migratory locust meal (Locusta migratoria) replaced fish meal up to 25% in the diets of Nile tilapia fingerlings (Oreochromis niloticus) without any adverse effect on the nutrient digestibility, growth performance and hematological parameters (Abanikannda, 2012; Emehinaiye, 2012).